This is actually something I did earlier this year but due to lack of spare time I has had low priority. 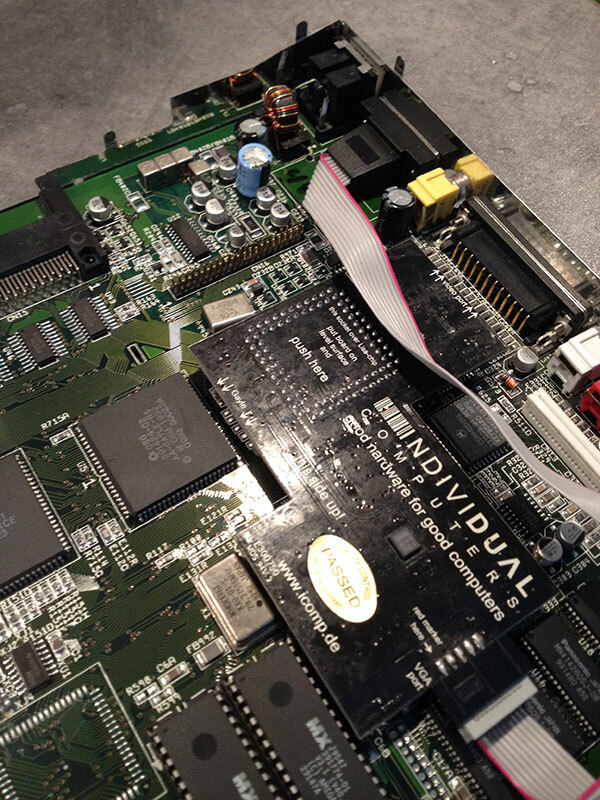 My Amiga 1200 had been more or less in a box for a VERY long time and before any new installations would be done I needed to see if everything was ok and while I was doing that, I would be a good idea to clean it as well. 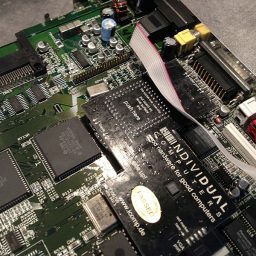 One thing that I had annoyed me alot was the loose VGA-connector from the Indivision MK1. A list was made of things that needed to be done and the result can be seen below. 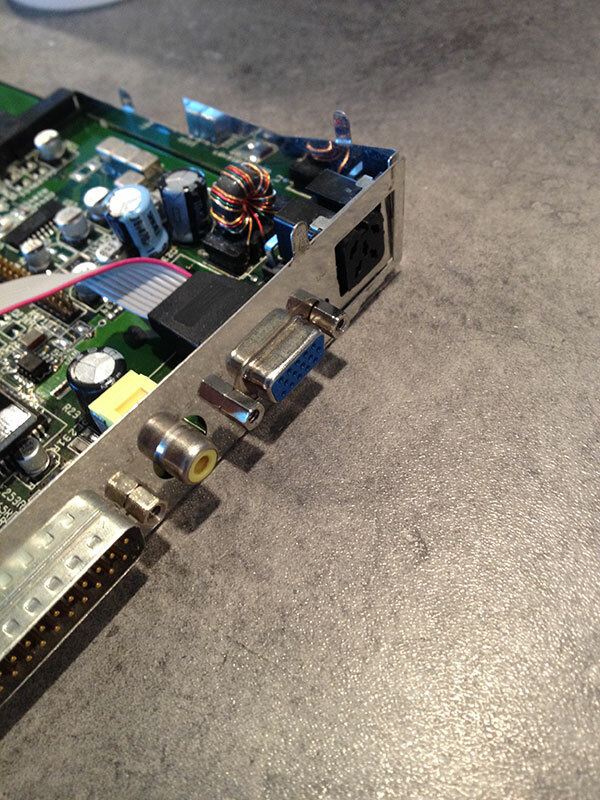 Mount the VGA-connector from the Indivision AGA MK1 where the RF-module had been placed. Modify the trapdoor for better airflow. Cleaning the keyboard and housing. So what are we waiting for? Let’s start working! This is fairly easy since it is only soldered at 6 point, 3 for the shielding and 3 for the acutal RF-component. The difficulty wasn’t the actual removal but combining that with a Whisky from Mackmyra. It is not one of the ordinary bottles but one from the barrel that my dad bought and stored at Mackmyra. Probably the best (and strongest ones of 56%) Mackmyra I’ve tried so far. 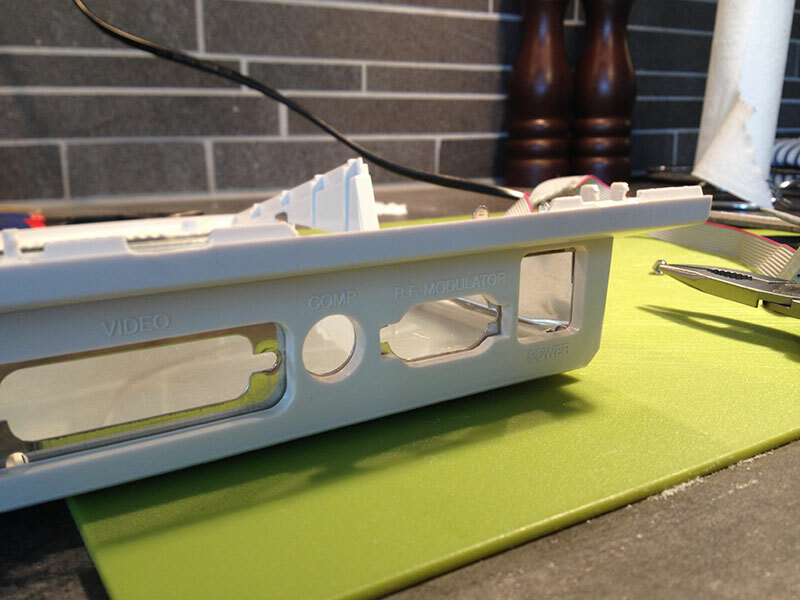 A smaller modification had to be done on the housing and metalshiled so the VGA-connector could fit. This was no match for my Dremel and tools. The only thing that was important is to be steady on your hand. The result can be seen below. I don’t know what Commodore was thinking about when they produced the Amiga 1200. 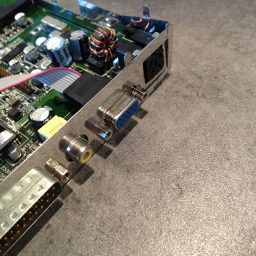 The cababilities of having good airflow is almost none and especially whern it comes to Amiga 1200 with BPPC or other 040/060 accellerators. The air is pushed down through the accellerator towards the bottom, but as most of you know, hot air goes up. 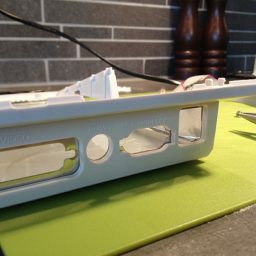 To make it a little better I decided to make some modifications of a trapdoor (I have a complete spare housing for Amiga 1200 if you wonder). Preparation, meassure and mark the position of the MC680x0, crystals and the PPC heatsink. Next step was to drill smaller holes into the trapdoor, about 1mm from the edge. Many wonders why, but a simple explanation is that you often need some extra margin to work with since nobody is perfect (hello, my name is Nobody!). After that, bigger holes were drilled as the picture below. The reason for this is due to the saw blade needs room. The result after the saw have had some action with the trapdoor. As you can see, there are ALOT of margin to work with. End result… A few minutes of working with the tools and a fine grained paper. While I was at it, a cleaning the keyboard was needed. Some keys were slow and well… When you shook it you could hear that it contained things that really should be in a keyboard. Before I started to disassemble the keyboard I decided to try a long-shot. I put the housing in my dishwasher and started it with a bit fear. Would it work or would I find a lump of plastic when it was finished? While the dishwasher was running (no, my girlfriend was NOT home when I did this) I started to disassemble the keyboard. Let me tell you this… In the future, the archeologists doesn’t have to dig in the mud and dirt. They only have to drive a vaccum cleaner through a keyboard to find the traces of the pre-historic humans. Since the previous result was so good I decided to run all keys and also the plastic backplane in the dishwasher as well. The result was yet again very good. All dirt gone and the keys had a shining like newly washed crystal glass, perhaps the reason was becuase I used such cleaning in the dishwasher. Now the re-assembly starts. Time to put back the keys and since my memory is good but short, I took a picture with my IPad that I used as reference. It worked pretty well and after a coffee and some ugly words coming from my mouth I was finally finished, and guess what, it worked like a sharm and without the strange noise.